Will the real Han Solo please stand up? 2016's Han Solo mini-series from Marvel comics was one of the early success stories from Marvel's recast Star Wars titles. The collected volume is likely to come under the spotlight again in the run up to next month's not so eagerly anticipated Solo stand-alone movie. 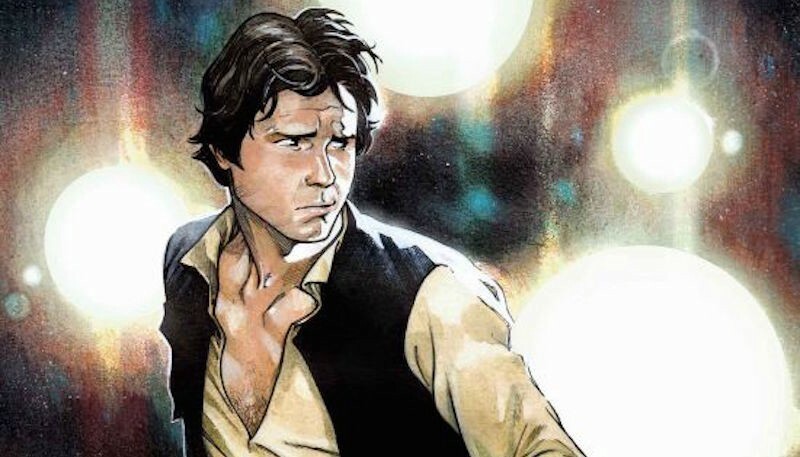 Solo fans may find that a small outlay on this Trade Paperback will give them a dose of Han in full Harrison Ford mode, if they aren't sold on the casting of Alden Ehrenreich. Let's see how this TPB stacks up. The strength of this mini-series rests in the fact that it was mostly set outside the core strictures/backdrop/cast of the original saga. It is a relatively self-contained title, with its simple focus on the activities of Han and Chewbacca. Those characters effectively dictate the direction once they have been given their instructions and mission. After that its Solo in charge, throwing abandon to the wind as only he can. Set after the events of A New Hope the joy of this volume is that it captures perfectly the swashbuckling element of the Solo character. 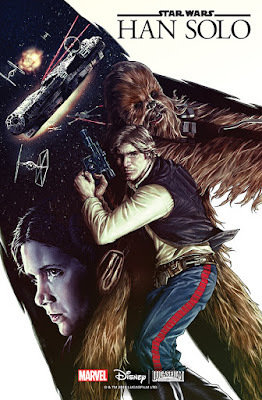 George Lucas enjoyed the series so much that he asked to purchase the art from artist Mark Brooks. That’s a solid endorsement and I have to say I'm in agreement with George. The plot serves Solo’s natural inclination to quick wit and flying by the seat of his pants. There is the usual funny repartee with Chewie. Unsurprisingly the two end up in a series of tight squeezes that they have to escape and outrun. Let’s just say that they want to avoid any Imperial entanglements. Alongside this there is a interesting subplot in relation to a murderer that is working in close proximity to Solo’s activities. A great decision for the title was adopting the mini-series format. 5 books constitutes the perfect length for this tale, leaves no room for padding, and lends itself to a short perfectly formed story. What was delivered to readers was an action packed “Saturday morning matinee” style story arc with a series of built in cliff-hangers. The format helps propel the story along briskly. The Han Solo title also gave us a wide diversity of alien species, quirky characters and Imperial villains. Importantly, they were perfectly set “in-universe”. Brooks’ artwork is sublime. It authentically captures the seedy cantinas, the atmosphere of the traveling party of the Dragon Void racing fraternity, and most importantly the thrill of the race. The book has a kinetic energy to it that is a vital trait of the Han Solo character in the films. 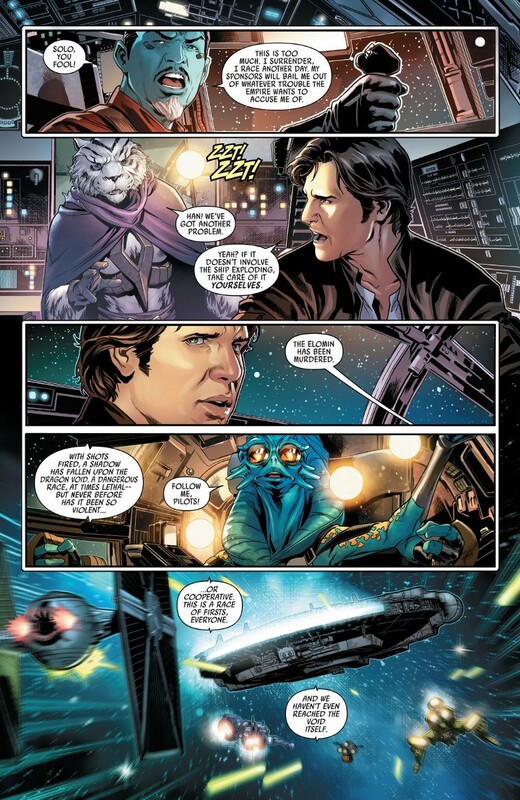 For those that read it the Han Solo mini-series actively demonstrates that the creative pairing of Liu and Brooks totally “get” the character. It will be interesting to see if the film does the same. We'll wish it luck, its gonna need it!